In regards to the photo of a gentlemen on the centre spot of a game thought to be in Earlsdon. Looks very much like Spencer Park Recreation Ground. 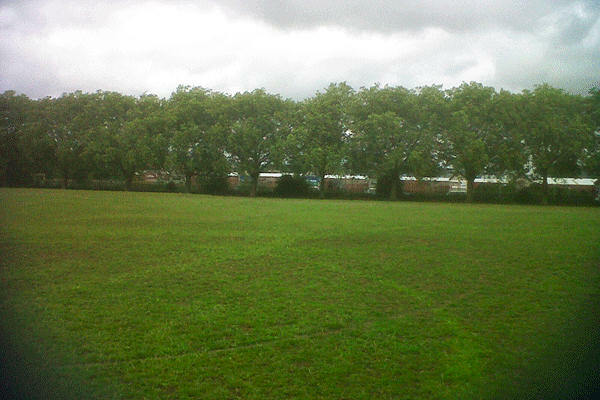 The line of trees in the distance is very similar and beyond the fence could be the railway line etc. The photo I have taken has all the greenery expected of this time of year however a walk there in the winter makes the view very similar to the football photograph. I am standing near the current centre spot of the pitch currently there as taking this photo Incidentally I work with a local football historian who tells me the gentleman would have been someone of local importance 'Kicking off the match' possibly a game of importance like a final etc. I knew it was a bad idea for me to start discussing on this forum lol as I'm hooked now. The photo with the markings on the right like a photo has been transferred on to it over time. If you tilt your laptop screen to sort of polarise the image or open the image in photoshop and use a similar effect you can read some more of the writing. I may be wrong but I'm sure by the 2 addresses in the Burges and Smithford Street etc it says delicious pork so was this a butchers business with 2 addresses? Also sure I can read (in vertical order) Oats, Brales Bros, Hillfields? That could be a very good shout as the trees on that path are very similar as well. Wonder what the chances are of the gentleman 'kicking the game off' could even be someone from the school itself maybe? The man in the picture is dressed more like a music hall artist than a teacher and the name Charles Coburn springs immediately to mind. He may have been appearing in Coventry at the Hippodrome or Sydenham Palace at the time? It's possible the player holding the trophy is Herbert Chatland. He played for Rudge F.C. and Singers F.C. 1893 to 1897. The gentleman next to him looks very much like Johnny Round,who had connections to Smethwick Carriage Works F.C. before coming to Coventry from his native Tipton in 1896. I would say all three photos are of Rudge-Whitworth F.C., this name being adopted by the club in 1896. The trophy may well be for the Coventry & District League, which Rudge won in the 1896/1897 campaign. Having researched the Singers v Rudge fixtures (1889 to 1898), I have never come across a Rudge player named Chapman. I think the schoolboy team photograph featuring Herbert is that of Saint John's Unity F.C., who advertised in 1892 for fixtures stating they were a team average age 17. Chatland lived at 34 Hood Street according to 1891 Census and was aged 16, occupation bicycle repairer. Has anyone information on Rudge F.C. or Johnny Round? I have tried to contact Andy Bates by email but my messages are not being received. Andy, could you please contact Rob Orland so he can put you in touch with me. I have some important information about the "Herbert Chapman" photographs. Is there anyone else out there who can put me in touch with Andy? The photographs do relate to Herbert Chapman and the Rudge Company. Originally I thought they were circa 1896 but new research has dated the photographs to 1917. Herbert Chapman was employed at the Rudge factory during the First World War. He organised men's and women's football matches to raise money for the Rudge-Whitworth Prisoner of War Fund. Photograph 1 is the Coventry Rudge Plane Department team who defeated Birmingham Rudge Press Department 3-1. The match was played at the Coventry Cricket Grounds, Butts on Saturday 21 April, 1917. Photograph 2 relates to another fundraising match played by teams representing the Stamp Shop and the Press Shop at the Rudge Coventry factory. The venue is probably Spencer Park in Earlsdon and the game took place on Saturday 13 January, 1917. Photograph 3 shows Victor A. Holroyd, Sales Manager of the Coventry Rudge factory. He performed the customary "kicking off" ceremony, watched by the referee who is standing behind him. The game was between teams representing the Rudge Birmingham Rea Street factory and the Coventry Rudge Works. This match raised money for the Mayor's Prisoner of War Fund and took place at Spencer Park on 24 March, 1917. Photograph 5 shows Herbert Chapman in the Saint John's football team. Andy Bates informs me that Herbert was in the Church Lads Brigade and the date on the football is 1911-1912. The Midland Daily Telegraph (forerunner to the Coventry Telegraph) gives results for a Saint John's C.L.B. (Church Lads Brigade) F.C. during the 1911-1912 season, so this is definitely a photograph of that team. 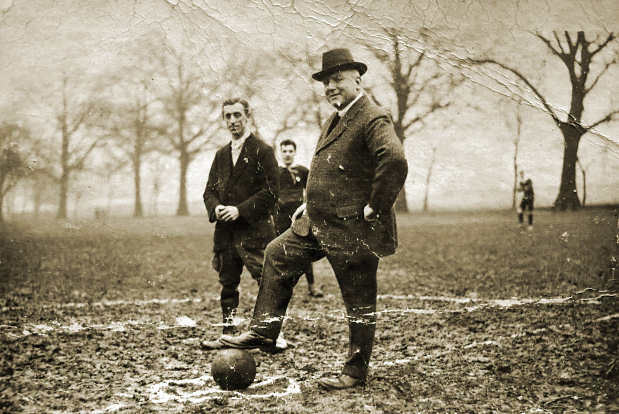 Herbert Chapman was born in 1889 so he would have been about 21 years old when the photograph was taken. Photographs 6 and 7 relate to the match described in Photograph 1. They show Herbert Chapman holding the Rudge inter-department trophy after winning the final. Herbert may well have been captain of the team and I am convinced the gentleman fourth from the left sitting next to Herbert, is Johnny Round, the Rudge secretary. He became a famous local football administrator being involved for 40+ years and was an important Executive Committee member of the Coventry City Supporters Club during the 1920's. The "Rudge-Whitworth Britains Best Bicycle" sign is at an entrance to the Coventry Cricket Grounds.